That feathered rex looks gorgeous! 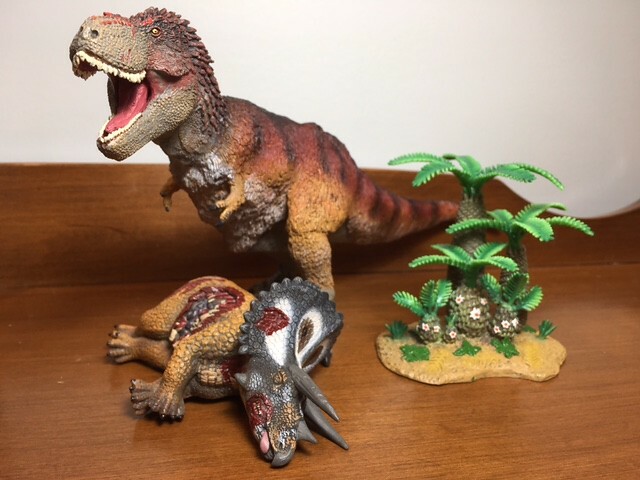 I was planning to buy the Collecta feathered rex, and maybe repaint it, but now I think I'll buy this one when it comes out! Yeah, the only dromaeosaurids in the Wild Safari line are featherless. The Utahraptor appears to have been retired about 8 years ago, with the Velociraptor replacing it and still being produced. Unfortunately, the Velociraptor has pronated hands, and is featherless despite being released 1. after it was known that Velociraptor had quill knobs, 2. two years after the Carnegie Microraptor, and 3. over 7 years after some dromaeosaurids were known to have feathers (Sinornithosaurus and Microraptor). Since Safari says they make "educational toys" and "toys that teach", and that Velociraptor figure has been around for so long without being replaced by a plausible-looking dromaeosaurid toy, I don't admire Safari as much as I used to or would otherwise. I'm not so sure there are going to be any more new dinosaurs or prehistoric animals than what we've already seen.I remember Doug Watson indicated that he sculpted fewer models for 2017 than he did for this year somewhere on this forum a while back. I come here a bit late. But can you blame me? This kind of stuff should not come out that soon! It looks AWESOME, easily surpasses the collecta one. Way, WAY better colors, it does not have a base and it does not have that horrible mohawk. It is a Safari figure, which means that it will likely be a small figure. Some of you have pointed out that the figure looks BIG in the photo and that could mean that Safari may start making bigger figures, so this figure could actually be bigger than the regular ones and comparable to other rexes like papo running or collecta. But I think that the posibilities of that are not very high, some of you have said that it just might be the photoshop. In that case it would mean that I still have to wait for a feathered T.rex in my collection. It would be a shame because the figure looks fantastic. But if it is not more or less the size of (for example) the papo running rex(wich, sadly, its the most likely situation) then there's still not a feathered rex for me. It looks fantastic, BUT I NEED IT IN A GOOD SIZE. I think it's just a bigger figure. The detailing looks a lot better and sharper than usual, which would make sense if it's a larger figure. I don't understand all these people insisting that the T. rex MUST be a larger figure simply because it looks so great in that photo. Doug's been turning out such detailed figures for years at the same relatively small scale. Are you forgetting the Yutyrannus? The Archaeopteryx? The Nasutoceratops? The Pachyrhinosaurus? I think it's going to be roughly about the same size as the 1989 and 2014 Carnegie ones.But whether it turns out to be big or small,it still looks great to me. I'd assume it's slighty larger than the previous rexes they've released. Hopefully the actual figures retain the amount of detailing that this prototype(?) has. Whereas I would argue that they're on par, especially the Yutyrannus. We shall see. Prototypes generally tend to be much prettier than the final retail version, that's one thing I know for sure. This single composite photo certainly is exciting, but it's probably best to wait for more releases. I'll say again too: I'd be thrilled to be proved wrong and this T. rex is actually in the same size category as CollectA and Papo, but I doubt it. Doug Watson has yet to comment on this thread . . . I agree, take a close look at the Nasutoceratops, Sauropelta, and Carcharadontosaurus, too. The paint applications don't show it well, but the details on those figures are really, really nice. Another thing that obscures this a bit is the blunting that's done to the claws and teeth. CollectA doesn't seem to do that as much. I hope you're right about this! But I hope you're wrong that these are the only three (I'm stoked about all three, but I'm also greedy. And it's only August. And Safari said the photo showed "some" of the 2017 releases). Most excited for that cephalopod (hard to tell if it's a squid or cuttlefish), here's hoping it's a giant soft model for the IC line! But the Tyrannosaur, booby, and Azhdarchid are must haves too. Kookaburra, alligator and Mosasaur are also nice but I already have models of these species so they're all maybes. I don't think I'd go out of my way for any of these figures, but if I saw them in a store and had some extra cash on hand, I'd probably consider the kookaburra and the booby. The squid is nice, too, even if it isn't a dinosaur toy. Also, I agree with the people who think that this Tyrannosaurus looks better than CollectA's, especially the deluxe version. I'm not a tyrannosaur afficionado, but I think it's a well-sculpted figure all the same. Walking pose is always nice, as far as saving space, but we've had a series of walking pterosaurs in the last few years. I need a good Azhdarchid. I have the Tyco and Scleichs and passed on the CollectA (great models but a tad bit cartoony). I'm a huge fan of the WS pterosaurs and have all their recent models. Safari Ltd. should redo their Pteranodon next. The Mosasaurus is reminiscent of the Carnegie Tylosaurus. Unfortunately until Safari Ltd identifies and releases details on the pieces I am not at liberty to divulge anything. I honestly don't remember saying anything like that since I am also not supposed to talk about how many pieces I am doing for each year. I can say of the three prehistoric pieces in this image I only did two of them. I do find all the rampant speculation entertaining. People do love to chat gossip and speculate no matter the medium! That's a very good point. Paint application does make quite the difference. Maybe the rex is just well painted and not larger afterall. Regardless of size, I'm still getting it!